Long have been the days of troubleshooting mechanical systems with a timing light, pop tester or an exhaust gas temperature probe. With the electronic advancements needed for meeting the latest emissions requirements, there has also come a reckoning of engine diagnostic and prognostic advancements. The industry standard for diesel diagnostics and fault handling comes from the SAE International J1939 specifications. These specifications outline the Controller Area Network (CAN) protocol for the wired interface and digital communication. CAN is what connects the various components of the machine: engine, transmission, display, hydraulic control module and programmable logic controller. All these components can be interconnected via the J1939 CAN network. When it comes to troubleshooting engine issues, there are many onboard diagnostics that can assist the modern technician. Equipped with a diagnostic service tool, technicians can now view machine data in real time directly on their computer. Being able to see how the machine is performing makes it possible to diagnose issues faster. The hardware component of J1939 CAN network is composed of a twisted wire pair with terminating resistors on either end of the main backbone. The resistors need to be 120 ohms apiece resulting in the wired network having a measured resistance of 60 ohms. Compared to systems with analogue or discrete digital signals for each sensor or actuator, the CAN network can drastically reduce the number of wires needed to communicate the same information or control. The original implementation of the J1939 CAN network protocol utilized a CAN bus speed of 250 k-baud. This standard has recently been increased to 500 k-baud for some applications. The increase in speed allows for more data transfer per second but does lessen the overall maximum length that the physical wires can reach without data degradation. To give an example, 250 k-baud systems can span 40 meters. The J1939 CAN network protocol incorporates a standard diagnostic messaging system for both active and stored faults. These are differentiated as DM1 active and DM2 stored previously active fault codes. When it comes to understanding fault codes, there are two key components: the suspect parameter number (SPN) and failure mode identifier (FMI). The SPN represents the physical sensor or system that is experiencing a fault. The FMI is a standard code to indicate the failure mode, on-board diagnostic issue or fault rationality. For example, if a fault code reads SPN 100 FMI 1, this would indicate that the engine oil pressure signal is valid but below normal operating range. Additional manufacturer information may be provided indicating a given fault’s detection condition along with possible root causes and even solutions. As a general understanding of the J1939 CAN network messaging protocol, the data comes across the CAN bus in packets. The packets are identified by a parameter group number, PGN, and have up to 8 bytes of associated data. A PGN message is further broken down into SPNs. The SPNs are the signal information that is coded into the bytes of data. When trying to read a J1939 CAN network data trace, we see the PGN first which will point us to the correct decoding of the data. The SPNs use a gain and offset to convert the byte data into readable units. 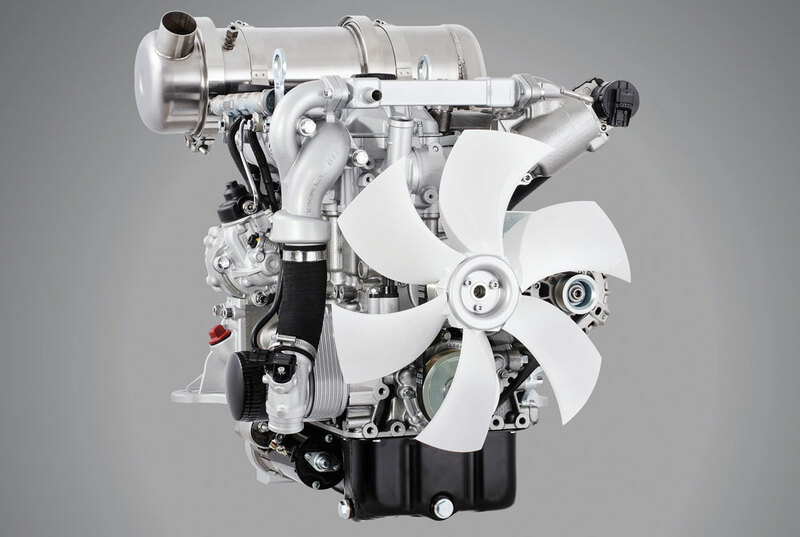 The Hatz H-Series diesel engines utilize the J1939 CAN network for control and diagnostics. With its state-of-the-art Bosch engine control system, real-time engine data is available. Using the HDS2 software, technicians can review and record engine parameters, read fault codes, perform test sequences, actuate engine components manually and re-flash the ECM. For control of the engine, one of the most common and flexible methods is using the J1939 CAN network torque speed command (TSC1) message. This message has components to command the engine’s speed, torque or both simultaneously. This level of control lends itself to every application from only a singular speed set point to applications needing to continuously monitor the machine’s performance to operate at the optimized speed and load point. This optimization can be used for minimizing fuel consumption, prolonging machine tool life or developing a multi-use machine for user and environmental operating conditions. To illustrate the possibilities of advanced troubleshooting, take the example of an engine that is not starting. The user is complaining when they go to start their machine in the morning, it does not start. The engine turns over, fuel is in the tank and the battery is charged. The Hatz diagnostic system will run a sequence with the HDS2 service tool to evaluate the possible non-start issue. Upon evaluation, a flag is raised on the resulting high-pressure fuel circuit pressure. The technician can then dive deeper into this fuel subsystem. After inspecting the fuel pump flow control valve, they can see that the connector is damaged. This caused the system not to reach the needed rail pressure for proper injection and, therefore, has difficulties starting. Another great example of troubleshooting made easier is an engine that runs but is running low on power. The technician can run a sequence with the HDS2 service tool to evaluate the power contribution of each cylinder. In this sequence the engine rpm is run up one cylinder at a time by supplying more fuel to one of the cylinders in anticipation that it will produce additional power to accelerate the engine. A comparison is done of the rpm reached by each cylinder. If the engine has a weak cylinder, it will show up with a significantly lower rpm reading. The technician then knows what cylinder to explore further. This process saves significant time from needing to prepare the engine for a compression check or manually checking each fuel injector. As the engines and machines get smarter so do the next generation of technicians. The tools are available to troubleshoot faster and get the customer’s machine repaired and back in service sooner. In summary, this article should give you a better understanding of J1939 CAN network along with an enhanced view of how state-of-the-art diagnostic tools can be used for machine diagnostics. Eric Hoffmann is an engineering manager and Matt Winski is a service manager at Hatz Diesel of North America.